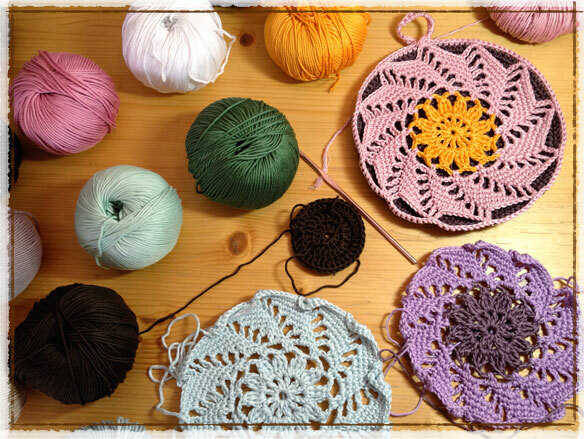 Yep, it’s that potholder swappin’ time of year which means I’m busy crocheting potholders once again. Last year’s swap was so much fun that I’ve actually been looking forward to this year’s right since the minute I sent last year’s off. Crazy, huh?!? I’ve got a nice stash of Drops Muskat cotton from Nordic Mart and I’ve been swatching away and think I’ve finally decided upon this pretty pinwheel motif that I got from one of my Japanese stitch dictionaries. I’m still tweaking it as my front is clearly too small so I’ll add another round so it doesn’t pucker. Come join us in the potholder swap group on Ravelry so you can catch a little potholder frenzy yourself. Your potholders are turning out beautifully!!! I hope I get one! Thanks so much Ellen. I hope I get one of yours too so I can start an Ellblo collection!